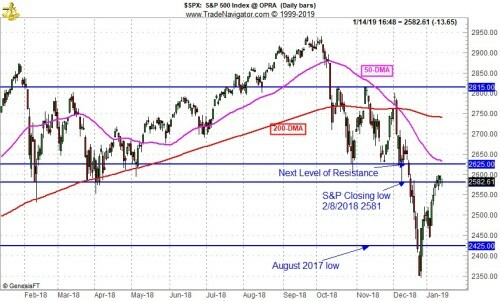 Now that the market has clawed its way back above the 2018 lows and encroaches on the 50-day moving averages, new overhead resistance that was once support is putting up a little fight. The market will need to hold and clear current levels to sustain momentum or regain it if we pull back from here. 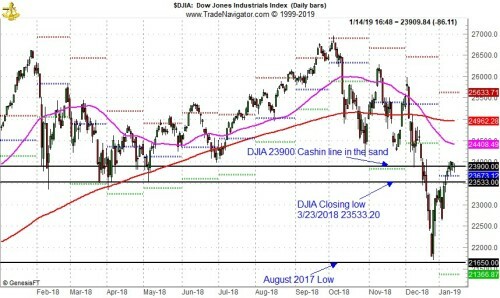 Caught the venerable Art Cashin on CNBC this afternoon and he pointed out a key level of DJIA(NYSEARCA:DIA) 23900, which is just above the February 8, 2018 low and runs right through big gap from November 28-30, 2017 that preceded the near vertical rise to the January 2018 high. As you can see in the chart above that has been a line in the sand the past several days. 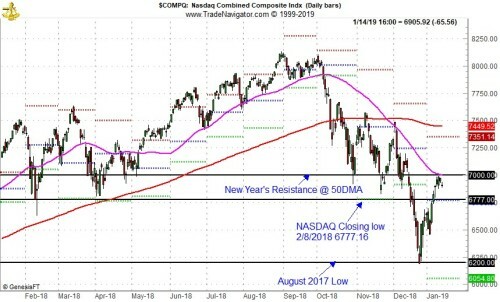 Below are charts of the S&P 500 (NYSEARCA:SPY) and NASDAQ(NYSEARCA:QQQ) Composite with similar resistance levels as well as the August 2017 lows that proved to be support on Christmas though S&P traded below that.